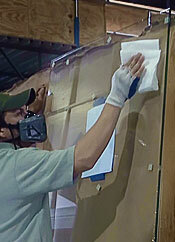 Dulles Glass and Mirror is an official partner of ClearShield Technologies, LLC. We are the only authorized ClearShield dealer in the greater Washington D.C. metropolitan area. We use ClearShield to treat our glass. 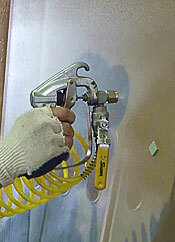 While it is more expensive than other glass treatments, it is by far the best in the industry. We know, because we have tested it ourselves. Other companies use wipes or sprays that coat the surface of the glass, protecting the glass for only a few weeks or months, requiring reapplication to restore its effectiveness. ClearShield is a one-time application, permanent coating product, and we stand by it! Glass is washed thoroughly and dried. Glass surface is inspected for irregularities. Specially formulated neutralizer is applied. Glass is cleaned and dried. A specially formulated conditioner is applied; this will prepare the glass surface at molecular level to bond to clearshield protective coat. 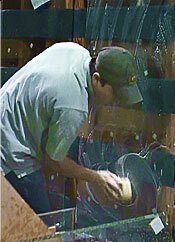 ClearShield polymeric resin is then applied to glass surface with compressor at high pressure. 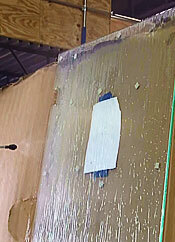 The polymeric resin forms a very thin, multi-molecular protective layer thanks to Clear Shield's unique cross-linking property. ClearShield becomes part of the glass through a strong chemical bond. Regular water is sprayed on the glass, If a chemical bond has occurred water will bead and roll off the glass. Glass is cleaned, sealed and buffed. ClearShield certified sticker is applied to the opposite side of the glass. This is an indication that the treated glass is of higher quality with a surface that is chemically inert and hydrophobic. Be Sure To Ask For ClearShield When Having a New Shower Enclosure Installed.